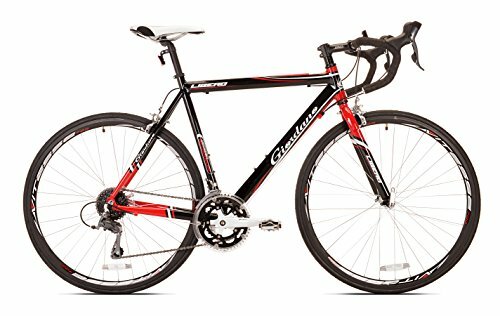 Giordano has made its reputation selling road bikes for the beginning rider. 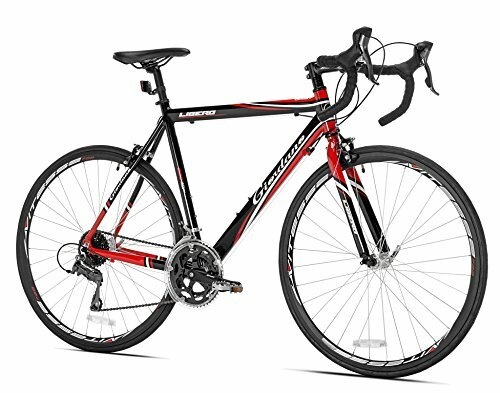 The Libero 1.6 is a superior bike offering higher quality than other less expensive entry-level models. For a reasonable price, under $500, the Libero 1.6 is a comfortable, lightweight, and reliable ride for entertainment, exercise, road biking, and racing. 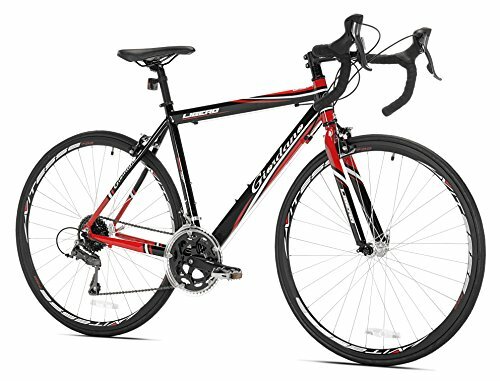 Coming in a black and red colour configuration, the bike comes in small, medium, and large to suit riders of all sizes. Whatever the size, they all cost only $449.99. The Libero 1.6 has undergone some improvements since first being offered for sale. 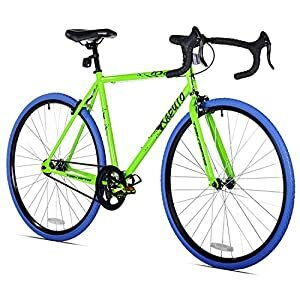 This is a well-thought-out model for road use, casual riding, and fitness and those wanting a better quality entry level bicycle. Riders 5 feet to 5 feet 7 inches in height with an inside leg length of 28-30 inches will find this a comfortable ride. The seat has a measured centre of 49 cm from bottom to top with a weight of 26 pounds. Riders 5 feet 8 inches to 6 feet in height with an inside leg length of 30-32 inches will find this a comfortable ride. The seat has a measured centre of 56.5 cm from bottom to top with a weight of 26.05 pounds. Riders 6 feet 2 inches to 6 feet 5 inches in height with an inside leg length of 33-35 inches will find this a comfortable ride. The seat has a measured centre of 61 cm from bottom to top with a weight of 29.7 pounds. The appearance of the Libero 1.6 is extremely attractive and well designed. It doesn’t weight much and is a comfortable ride for those users wishing to engage in rigorous workouts or easy hauling. The 16 speed shifters are easy to operate and provide solid and reliable gear change. Shifting gears is quick and smooth without any noise. Right out of the box, the derailleurs need little to no adjustment with superior quality cranks. The tape covering the handlebar is higher in quality than other comparable bikes, although the tape color is white and tends to get dirty quicker. A kickstand is included in your purchase. When compared to the Vilano Shadow, the often inferior wheel rims are better in quality. While the prices of the Shadow and Libero 1.6 are different, the quality found in the less expensive Libero 1.6 is genuinely remarkable. Giordano hasn’t sacrificed quality to arrive at a reasonable selling price. While aluminum frames are used on some bicycles to reduce costs, the Libero 1.6 has an aluminum frame that is hand-crafted and more rigid while being lightweight yet solid enough to engage in the full range of road riding activities. The brakes are middle of the road for a beginner’s cycle. Some reviewers have found that it could be a good idea to upgrade the brakes. A good 2 to 5 feet of clearance is necessary to come to a stop at full speed. The pads included with the bike are a bit soft decreasing their power to stop. However, new brakes aren’t that expensive and you can buy them with confidence at any reputable bicycle shop. The wheels may need quite a bit of adjustment, especially in the front. This kind of adjustment is only used by very experienced riders who normally do a lot of work on their bikes themselves. 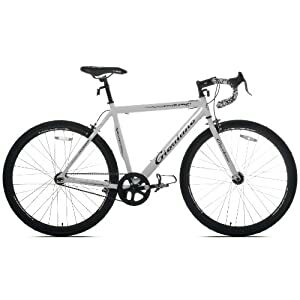 A reputable bicycle shop is your best bet to make sure the wheel configurations are solid and stable. 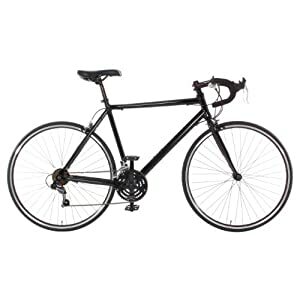 The Libero 1.6 is attractive and nicely styled for road use at a great value for the money. 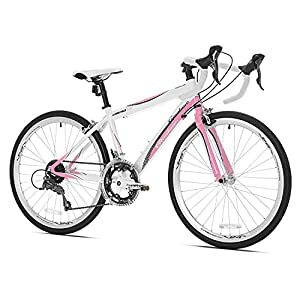 The components of the bike are of measurably better quality than found in less expensive models. While the brakes aren’t perfect, the shifters and gears work well once properly adjusted at the bike shop. You can ride this bike for entertainment, a ride around where you live, climbing, commuting, racing, and other uses. It has the quality of value of a fine road bike. The three sizes offer an excellent range for riders from 5 feet to 6 feet 5 inches in height. You are almost guaranteed to find the perfect fit for you. The tubes are solid and stand up to miles and miles of wear. You can count on the tires to be reliable and work in any weather. This Libero 1.6 can be assembled and used right out of the box, but should be tuned up by a bicycle shop prior to riding it. All components work well with each other. The one real negative of this model is the brakes. If you’re unable to stop, it is much too dangerous to ride. However, you can exchange brakes at your local bike shop and this inexpensive upgrade will increase the performance and quality of your bike instantly.